Jim Weeks in his home workshop. Wood knots transform themselves into exquisite ornamental patterns and wood grains flow gracefully into matching lid grains. Weeks will be showing Nokomis Art Market visitors examples of discarded wood pieces that he turned into things of beauty and explaining how he obtains the wood itself. “If you see a guy checking yard waste piles or chasing the sound of chain saws to see what tree is coming down, it is probably me. After Irma there was a silver lining for me as I was able to gather pieces of my favorite woods such as rosewood, jacaranda, maple, and Norfolk Island pine,” explained Weeks. 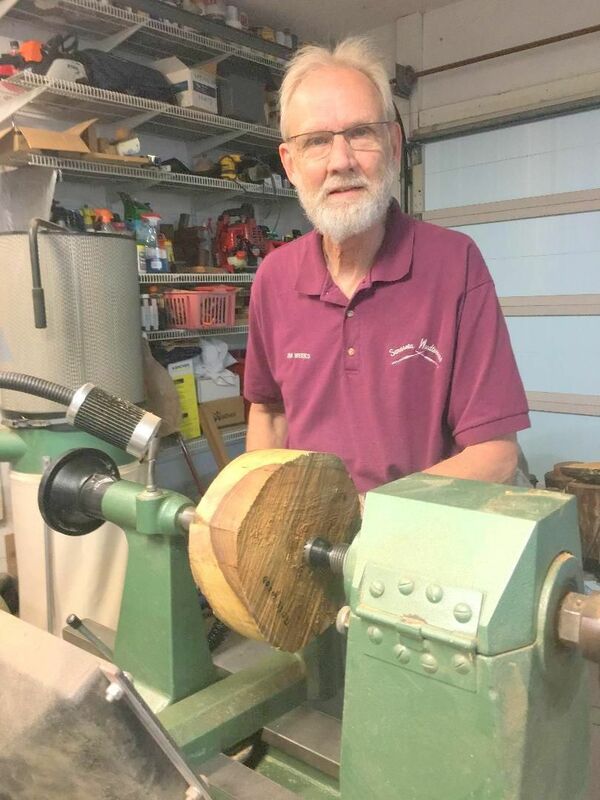 Although Weeks, a retired surgeon from Minnesota, has only been a serious wood turner for the past five years, his interest in wood turning began twenty years ago when his wife, Lois, enrolled him in a woodturning class as a gift. He proceeded to purchase a lathe and some tools, but soon realized that he needed additional mentoring. “I thought I might take another class, but with a full time job and four kids to support, it never happened. My lathe sat in storage for over 20 years,” he said. Now retired and living in Nokomis, Weeks enjoys working in his garage shop where he has amassed hundreds of tools. Three Tuesdays a month he works to improve his wood turning techniques with fellow Sarasota Woodturners Club members. One Saturday a month Weeks and others serve as instructors teaching newer members how to create bowls as donations for local Empty Bowls programs. As Volunteer Associates, Jim and Lois Weeks often travel to Guatemala with Helps International, an organization that assists Guatemala villagers in need of basic household items including cooking or heating equipment. 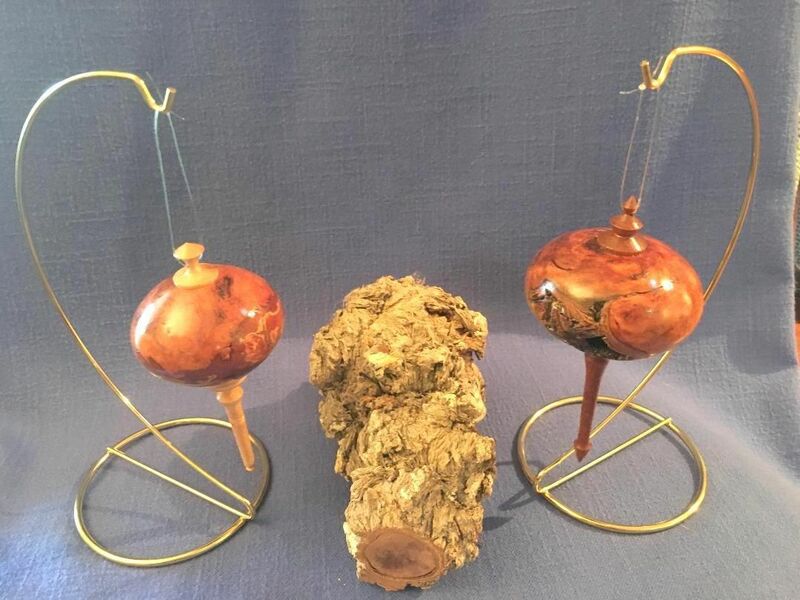 Throughout the year Weeks displays his work for sale at the Cottage Gallery of Art, located at 106 Pocono Trail E., Nokomis, but this month he will be a featured artist at the Nokomis Art & Craft Market taking place on the Cottage grounds on April 20, from 9:30 a.m. to 4:30 p.m. The centrally located display area extends between Café Evergreen, Rum Runner’s Antiques Mall, Nokomis Art Space and the Cottage Gallery of Art. Over 50 new and returning vendors will be offering their wares for sale. As featured artist Weeks will greet visitors and exhibit his artwork for sale. He’ll also exhibit before and after photos along with actual before and after wood art pieces that he has created over the years. His work will be featured at the Cottage Gallery throughout the month of April.